Welcome to the marathonrally.com newssection. 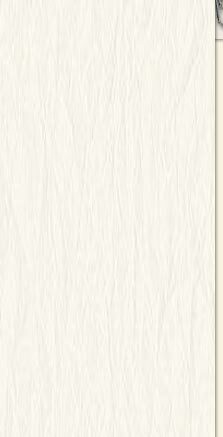 Here you can find the article you selected. For a full selection of news please click on "NEWS & LIVEREPORTS", for older articles use the search function in top of the right navigation. 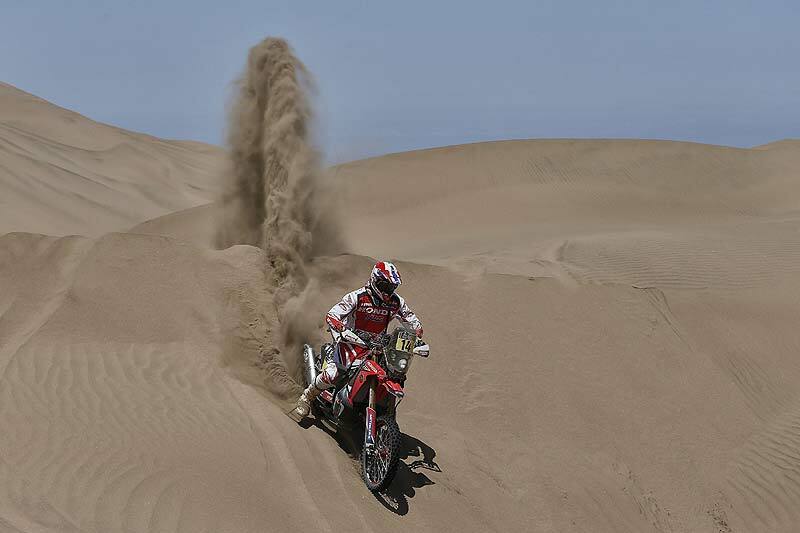 Dakar Rally 2014: Spectacular double for Honda - Barreda still second overall. It was a fourth stage win for Joan Barreda in the 2014 Rally Dakar, and a fifth victory for the Honda CRF450 Rally, as the team completed the double with Hélder Rodrigues coming in second. Javier Pizzolito ends in 8th place. 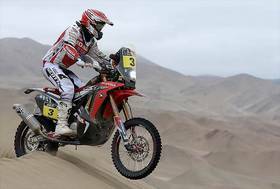 The tenth stage proved to be a really long but fruitful one for the Honda riders who stole the top two positions on the CRF450 Rally. Joan Barreda dominated the Antofagasta stage with Hélder Rodrigues finishing the 688 km course behind him. Joan Barreda had previously picked up a fifteen-minute penalty for speeding in a radar control in the special on Tuesday. The Sentinel alarm system that reminds the riders they are entering an obligatory reduced speed zone failed to sound, and the rider from Spain momentarily exceeded the limit. From the outset today, he set about making up the lost time on Marc Coma, his direct rival - overall he is still second with a gap of 44:10 minutes to Marc Coma. "It was a real shame about yesterday," said Joan Barreda. 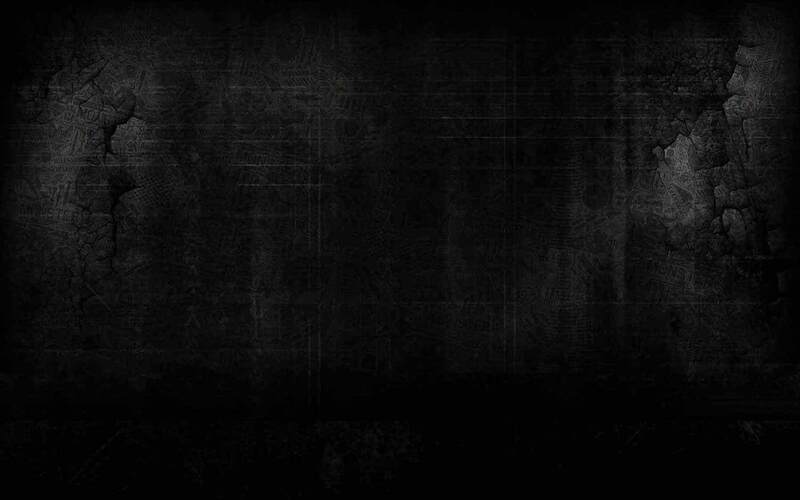 "I was relying on the Iritrack alarm sounding, but by the time I realized that it hadn’t gone off, it was already too late. A shame. Today we started out from behind and I had to stay really focused because the navigation was tricky. I kept a cool head and kept upping the pace with every kilometer. I clawed back a few minutes. Let’s see how it plays out on Thursday in El Salvador." Hélder Rodrigues too, got off to a flying start, hotting up the pace from the previous outings as he seeks to secure a podium place. 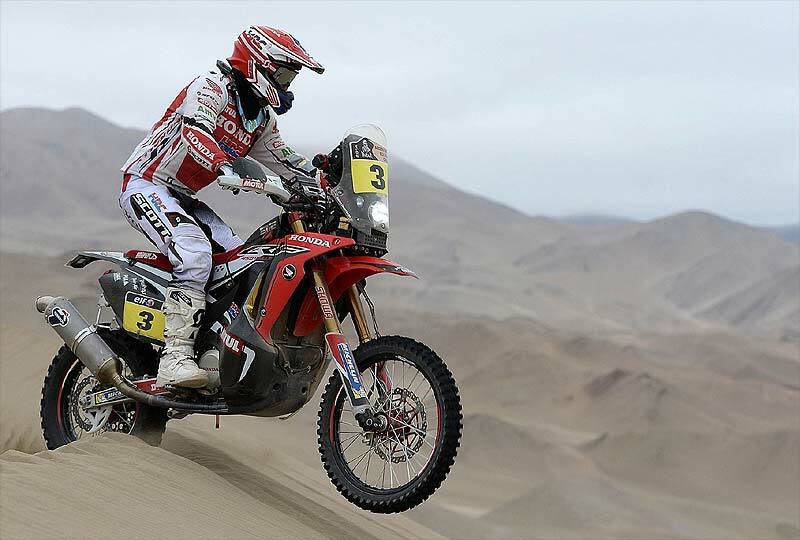 Barreda caught him up and the two crossed the finish-line together. In doing so, Rodrigues outruns his immediate rivals for the third place, and now occupies fifth overall position just 19 minutes off the podium. "It’s been a good day for me," Rodrigues reported in the camp. "I tried to push really, really hard. It turned out well. I passed the dunes and saw only two indications. It was Cyril and Marc. I kept trying to gain on them until Joan caught up with me. We finished together. In the end Joan took the stage and I was second. It’s been really good for Honda and for me too. I’m pleased." 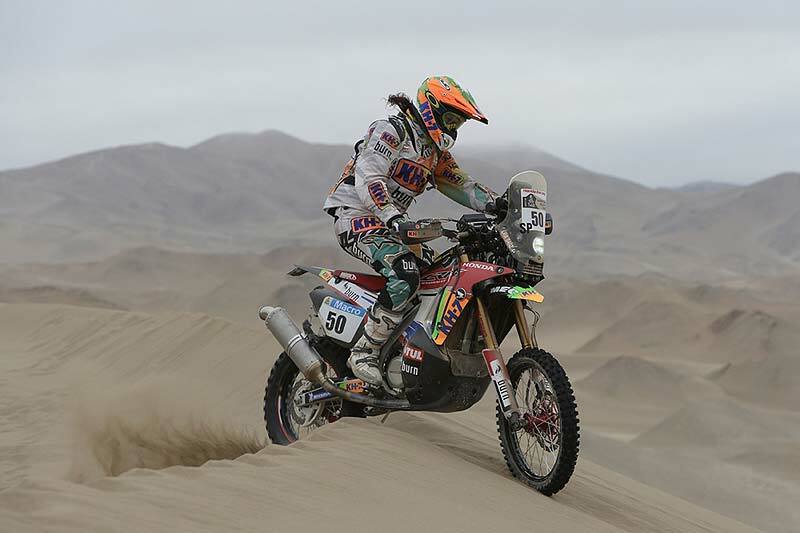 Javier Pizzolito put in a good stage performance too, picking up his best result so far in the Dakar 2014, arriving in Antofagasta with the eighth best time on the day. "It was a really nice, but long special" he said. "The first part with dunes had a bit of everything; the second with fesh-fesh and hidden rocks. I had a few issues with a fuel pipe that unnerved me a little but not too much. The bike ran really well with a high speed of 183 km/h, and that means the bike is... ‘wicked’!" 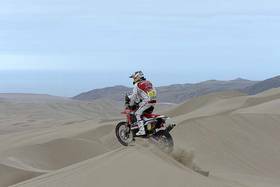 It was also a good day for Honda Argentina Rally Team, who are being supported by Honda with the new pre-production CRF450 Rally machine, with Laia Sanz continuing to break new ground for female motor sport. The Honda Argentina Rally Team rider finished the ninth stage of the Dakar in seventh place, which marks a best female partial classification so far to date in the rally. Today both Laia and team-mate Pablo Rodríguez finished a long gruelling stage in respectable positions after suffering some problems after a crash.